A small papyrus fragment, with the present text written on the recto (there is nothing written on the verso), across the fibres, and in a quick scribal hand using uncial and cursive forms. The text is dated “Phamenoth 3 in the third year of Valerianus and Gallienus,” which equates to 28th February 256 CE. 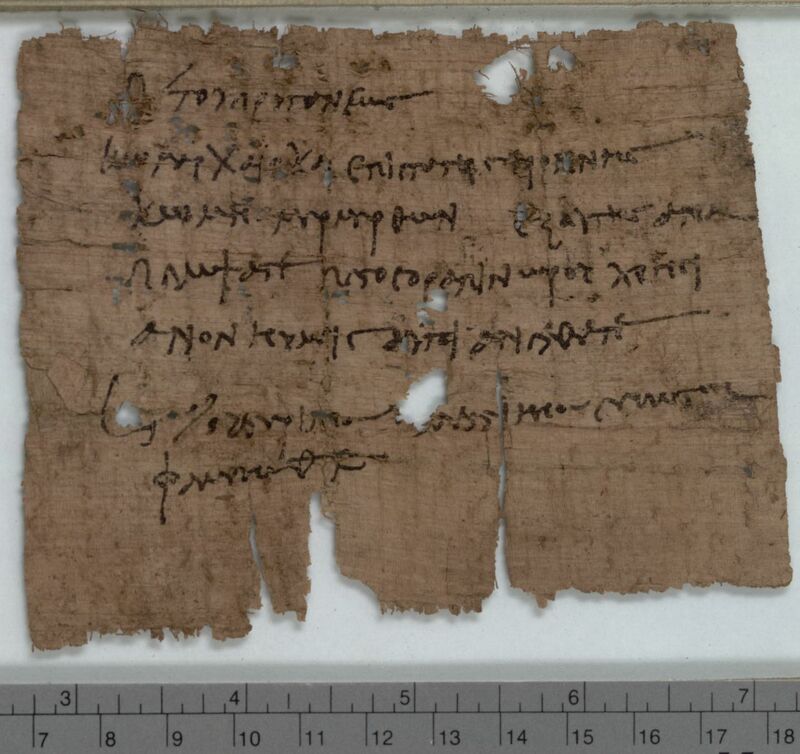 This papyrus contains a very brief order from the head of the council of Oxyrhynchus (the prytanis) for the local comarchs (see Brélaz, La sécurité publique, in which he discusses the role of these magistrates in the Christian martyrdom accounts) to seek out a man named Petosorapis, son of Horus, who is described as a Christian, and apparently lives in the village of Mermertha. The papyrus is interesting firstly because it contains one of the earliest uses of the word ‘Christian’ (Χριστιανός, Christianos) on a papyrus. We are not given a reason for the warrant to arrest Petosorapis, and while it has been tempting for some to jump to the conclusion that we have here evidence for the persecution under the emperor Valerian, this is purely speculative; there could have been any number of reasons for this man’s requested presence before the prytanis, and the fact that he is described as a Christian may simply be because it was considered to be a helpful identifying factor for those looking for him, and it was something that Petosorapis did not conceal (see Parsons, P.Oxy. 42.3035, p. 100). Even though this document is frequently referred to as an “order to arrest” (following the classification given by Bernard Grenfell and Arthur Hunt in their editions of the Oxyrhynchus papyri) there is actually no mention of any arresting, and so as AnneMarie Luijendijk highlights, it is more accurate to term it a “summons” (Greetings in the Lord, p. 177; for more on this and other similar documents, of which around one-hundred have been published, see Traianos Gagos and Pieter Sijpesteijn, “So-called ‘Orders to Arrest’”; Adam Bülow-Jacobsen, “Orders to Arrest”; Judge et al., “Summons for Petosorapis”). Like other similar documents, the term used is derived from the verb “to send” (πέμπω, pempō). Luijendijk identifies six ways in which the present papyrus deviates from the majority of other summonses. Firstly, it is written along, rather than against the fibres of the papyrus. Secondly, it is one of only two to contain a date with a year formula (the other being P.Med. 71.39). Thirdly, its wording is slightly different, with the prytanis requesting Petosorapis be “sent up” “at once”. Fourthly, it does not give a specific reason for why Petosorapis is being summoned. Fifthly, the komarchs are given the option to go to the prytanis themselves if they cannot bring Petosorapis. Finally, the mention of the prytanis as the sender of the summons is found only in one other similar papyrus. Luijendijk hypothesises that this last point might also account for some of the other divergences; for instance, perhaps because the office of the prytanis did not produce these summonses on a mass scale, they did not need to conserve papyrus, and so could afford to write across the fibers rather than writing against those of leftover rolls (Greetings in the Lord, p. 178-179). Just how relevant is the fact that Petosorapis is identified as a Christian, then? Edwin Judge and Pickering have observed that the word “Christian” is in the place that might otherwise be filled with a person’s occupation (“Papyrus Documentation,” p. 59). For instance, another similar document asks for a certain Eros, who is identified as a wine merchant (P.Oxy. 31.2576). As Luijendijk considers, it is uncertain exactly how the term “Christian” is intended to assist the ‘police’ sent to look for Petosorapis. Was he a prominent Christian, such as a member of the clergy, and therefore Christianity was effectively understood as his profession (see Judge, “Summons for Petosorapis,” p. 2)? Perhaps, then, his seekers would then know to look for him in a church, as they would know to go to the market place to find a wine merchant. Equally, however, it might have simply been that Christians were not particularly numerous in this particular village, meaning that he would be relatively easy to identify. The question cannot be answered with any certainty. Furthermore, why was he required to attend a trial? It has been suggested by Hans-Joachim Drexhage, on the basis of the reasons for many other second and third-century summonses, that tax evasion is a possibility (see “Überstellungsbefehlen,” p. 118). Scholars such as Judge and Pickering have suggested that in the aftermath of the emperor Decius’s edict of universal sacrifice, the authorities were now aware of those who willingly identified as Christians, and therefore could use this as an identifying feature when any legal action was required against such as person (“Papyrus Documentation,” p. 67). This does not mean, however, that Petosorapis’s Christianity was the reason for his summons. There is a fundamental problem with attributing his arrest to the persecution under Valerian, as Valerian only began taking action against prominent Christians the year after the present papyrus is dated (the ‘persecution’ under Valerian was between 257 and 258 CE; on Valerian’s persecution, see, for example, Schwarte, “Die Christengesetze Valerians”; Selinger, The Mid-Third Century Persecutions). Granted, a scribal error with the dating of the papyrus is plausible, and does occur in other papyri (see Luijendijk, Greetings in the Lord, p. 182), but it is still a huge stretch to associate Petosorapis with Valerian’s persecution. For starters, we know nothing of his social status, other than the uncertain possibility that his identification as Christian might indicate he was a member of the clergy. Luijendijk is happy to give the persecution theory significant weight, and argues that it was indeed the prytanis who was responsible for the implementation of imperial edicts in his jurisdiction (Greetings in the Lord, p. 183). For instance, the prytanis would oversee the sacrifices required under Decius’s edict (see Papyrus Rylands 12 ). Unfortunately, it is impossible to be more certain in our conclusions than simply to say that Petosorapis’s summons may have been due to his Christianity, but equally could be for reasons entirely unrelated.